This product is intended for a broad audience which includes office workers, educators, students and anyone interested in creating a collaborative session with colleagues and peers. This was challenging in terms of aligning our development team in terms of priorities and expectations since our company typically targets extremely technical A/V professionals. The ShareLink application is a collaborative tool, which allows several users to share multiple images and sources on a large display in the same room. This is the first mobile and cross-platform application developed in house at Extron. Perspective of a user testing the software. Once connected to a ShareLink device users can choose to share content to show on the large display in a room. Create a seamless, multi-platform sharing application that's easy to download and use. Allow users to share video, images, websites, and mirror their screen or application windows. Allow certain users to manage sessions by controlling the content and participant behavior. Provide an updated and brand consistent visual appearance. Evaluating existing design patterns in place, and describing to development groups. One of hundreds of wireflows. After reviewing existing software, competitors and new requirements we began by creating concepts for mobile platforms and desktop platforms at the same time to ensure multi-platform consistency. We conducted several rounds of usability tests at different stages in the development to uncover issues and adjust the designs throughout the development process. The ShareLink software will be available on Windows, Macintosh, Android and iOs platforms and will provide a consistent experience across all channels. Despite changing project requirements and technical limitations this product is expected to launch in Q3 2018. In addition to the current feature set, we recommended that the future software include a streamlined connection process, direct manipulation of the images and the ability to move them around on the display, and an more attention given to omnichannel experience of allowing the users to share their session with colleagues or switch channels to suit their need. Our team discovered during development that creating an identical visual appearance in applications on every platform was an incredibly challenging endeavor. In the future, we recommend that developers allow variation among each platform as long as they support the same core functionality and feature set among each device. 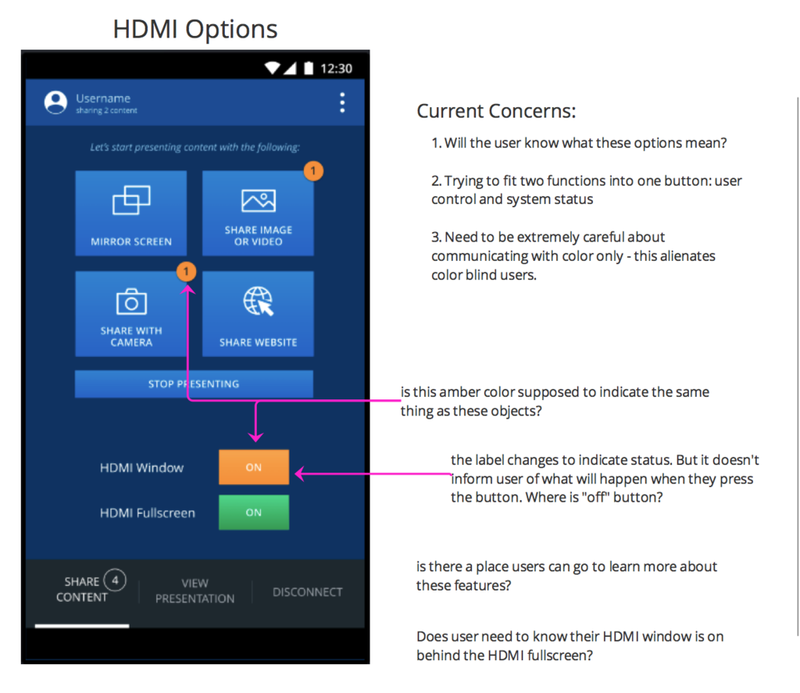 Exploring the differences between native application variations of a contextual menu. Exploring the differences between native app variations for the sharing content screen.